Measurements: 2.57 x 3.93 inches, or 65 x 100 mm. Back of card: Pale gray-ish yellow with a barely visible, medieval radiant sun in white. Not symmetrical, but so low contrast as to be invisible, so may be inverted, though it's unlikely you will. Book included: Yes, 144 pages, 5.15 x 6.94 inches, or 13 x 17.6 cm. This are also the outside dimensions of the package, as the rear cover of the book folds over the space allotted for the cards themselves (poor packaging, in our view). Illustrated, English only. Publisher: St. Martin's Griffin. Printed in China. Comments: This is a deck designed to teach astrology. 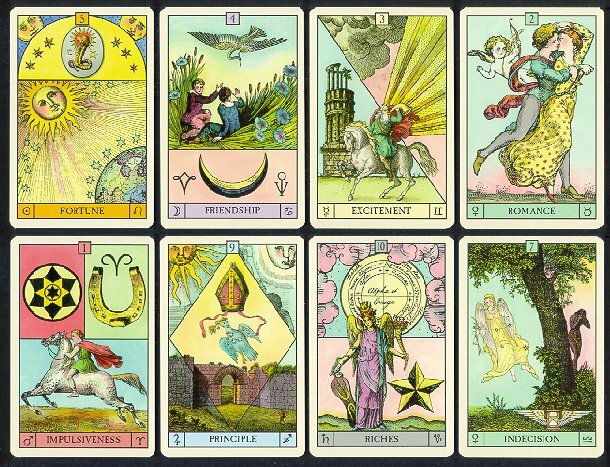 Each of the seven classical planets, Sun, Moon, Mercury, Venus, Mars, Jupiter, Saturn, is given twelve cards, one for each sign of the zodiac. So these cards are a pictorial representation of all planet-sign possibilities. As my layout permits one more card, I added Venus in Libra. Note that each planet has its own layout: The Sun layout is a square & semi-circle, the Moon a square & rectangle, Mercury two triangles, etc. Look closely at the Sun, Mars & Jupiter cards, above. Outside the Sun's semicircle are two more Suns. In the upper left corner of Mars is an encircled star, which might be mistaken for the solar symbol. In the upper left & right corners of Jupiter are the Sun & Moon. This almost seems to be the start of essential dignities/debilities, but, alas, of the cards shown, only Sun on Mars/Aries would be correct. The pictures are pretty. The astrology is mixed. Some cards work, some don't, so far as I can tell.